1. I never give up. I just console myself with chocolate and move on. 2. The kids would’ve notified the authorities if I didn’t return from the woods in time for dinner or when their stomach pains become unbearable from eating all the snacks in the pantry, every box of sugar cereal, the treats in the cookie jar, and all the ice cream. 3. I never get tired of complaining. When my friends and family won’t listen anymore I just, well….now you know why I started this blog. So I did finish the fence. But the completion wasn’t even the best part. No, the fence story had a really happy ending. I know that’s not very vogue right now. For some reason Hollywood thinks America is looking for endings that include tragedy, misery, and uncertainty. Jeez, Hollywood, I could just read the newspaper for that! Around here we prefer happily ever after with a bit of “all’s well that ends well” thrown in for good measure. 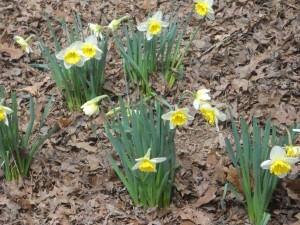 It started when I found that patch of daffodils growing wild in the far back corner of the property. They were hiding, no doubt, from the free range hens that don’t eat daffodils so much as torture them—stripping their glossy green leaves and trampling their bright yellow heads. But here were some wily survivors that I might never have seen if I wasn’t out rambling through the woods with my wire cutters and poultry staples. There were 5 or 6 clumps of these spring harbingers so perhaps they were spreading, quiet and determined, tucked in the leaf debris. A reminder that we never struggle alone in this life, some of us just toil a little louder than others (no comments from the peanut gallery, please). And then there was that astounding, eye-opening moment when I realized I was getting rained on. Not an ordinary rain. No, this sprinkle started with the whisper of a fall and the softest pat of a landing. At first, I kept stopping work at that slight sound and looking behind myself through the trees. No chicken tip toeing up, hoping for scraps. No pony giving away his approach with the soft swish of his tail. After awhile I checked the tree trunks and limbs for the source of the gentle sound. No squirrel moving deftly through the canopy. No bird flitting gently from branch to branch. And then it happened right before my eyes. A pine cone dropped from its perch and nestled snugly in the leaves and needles below. In a minute or so, another fell to the forest floor. And another. 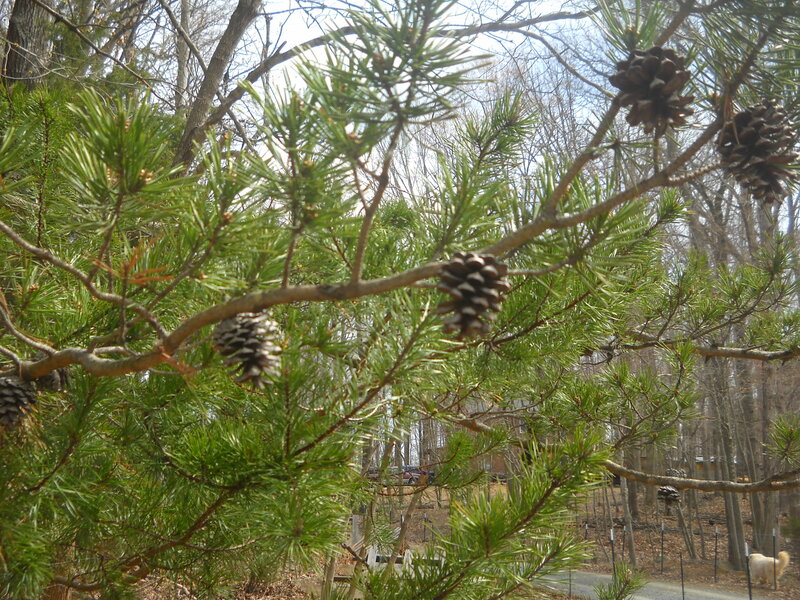 Without the slightest breeze, the pine trees were gradually shedding the winter’s store of pine cones. The sound was almost imperceptible among the birdsong–hard to say if you actually heard it or just felt the air momentarily displaced by the fall. For a moment I panicked. What was wrong with the pine trees that they were dropping their pine cones? Then I remembered something I used to know. Back when I spent my time studying the life cycle of frogs, how a caterpillar becomes a butterfly, and labeling the parts of a plant. When getting to use glue sticks was a good day and a broken pencil tip was an awful one. You know, the important things we all learned before we spent our days studying amortization tables for our mortgage and trying to understand the Earned income Tax Credit. Remember? Pine cones are just a vessel for seeds. And spring is the time for sowing seeds. See, that’s what farming does for you. It takes your blood, sweat, and tears and, in return, gives you a touch of God’s hand on your shoulder. Like a hidden cache of daffodils. Or a rain shower of pine cones. It’s all right there. Waiting for someone out there to see it. Even if that someone is just a farmer, tediously using cage clips to attach chicken wire to field fencing. On the way up to the house, a pine cone in my hand and a daffodil tucked behind my ear, I passed my neighbor. 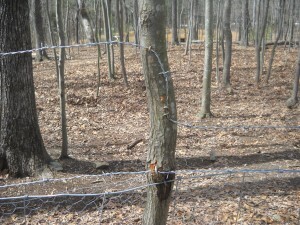 He pointed to the top strand of barbed wire, running along the field fencing. I turned back, incredulous, to stare at my handiwork. Huh. It was definitely crooked. In some places it lay gently on the field fencing. In others it hovered 6 inches above. 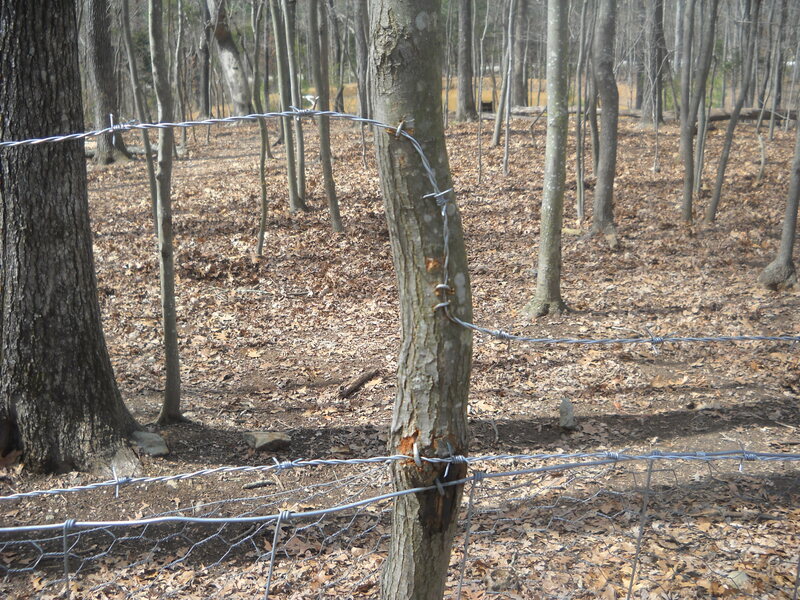 In some sections the barbed wire went from above to below and back up again. I paused for a moment. Then I took a deep breath in order to explain how hard it was to pull the wire tight and how it curled up on itself when you were working and how the 4 year old was terrible at holding the wire steady while I hammered the staples in even though I only accidentally hammered his hand that one time, but then I stopped. “It’s a trick that messes with the visual acuity of any animals trying to get over the fence,” I said seriously. “Really?” He asked again. I nodded sagely, and adjusted my wire clippers and bolt cutters in my tool belt to emphasize my expertise. Oh, and I can’t wait to see it. That’ ll make my fence look like it was put up by Frank Lloyd Wright. And if that’s not happily ever after, then what is? I hope your neighbor doesn’t read this blog! No way. Neighbors have to have boundaries!!! I love how positive and upbeat you are, even in the face of adversity. Glad you stopped complaining this time.. Ha Ha. See you soon. 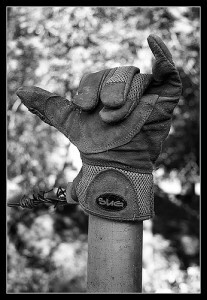 Hey, I took that glove picture! And I love it! It shows your name in the rollover and has your flickr link imbedded. Do you have a different link for your work that you would like attached? I like a lot of your black and white farm photos. And it looks like you had a great day at a sheep farm, too! Your usage is fine. Feel free. I’ll that if you google up, you will find that an asymmetrical strand of barbed wire with disproportianate placement negatively affects…..umm what you said. Anyway, I’m absolutely sure it’s a fact. No question. At least no question from me. I’m glad to know you finished your fence. I was definitely getting worried.